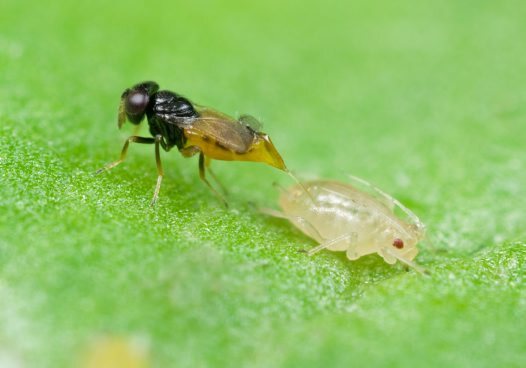 Female Aphelinus ovipositing into aphid, photographed by Denis Crawford. Aphelinus is a genus of minute wasps that are parasitic as larvae on aphids. Characters (from Hayat 1983): Antenna six-segmented; axillae slightly to strongly projecting forwards, usually extending caudad beyond anterior pair of scutellar setae; mesopleurum divided by an oblique suture into epimeron and episternum; distance between posterior pair of scutellar setae equal to or greater than that between anterior pair; forewing with linea calva; tarsal claws equal in length; spur of middle tibia densely setose; female with hypopygium prominent, extending to apex of gaster or beyond. [G19] Girault, A. A. 1919. Hymenoptera Chalcidoidea nova Australiensis. Privately published (reprinted Gordh, G., A. S. Menke, E. C. Dahms & J. C. Hall. 1979. The privately printed papers of A. A. Girault. Memoirs of the American Entomological Institute 28: 153-156). [G25] Girault, A. A. 1925. An essay on when a fly is lovable, the ceremony of baptizing some and unlovely hate. Privately published (reprinted Gordh, G., A. S. Menke, E. C. Dahms & J. C. Hall. 1979. The privately printed papers of A. A. Girault. Memoirs of the American Entomological Institute 28: 187-190).